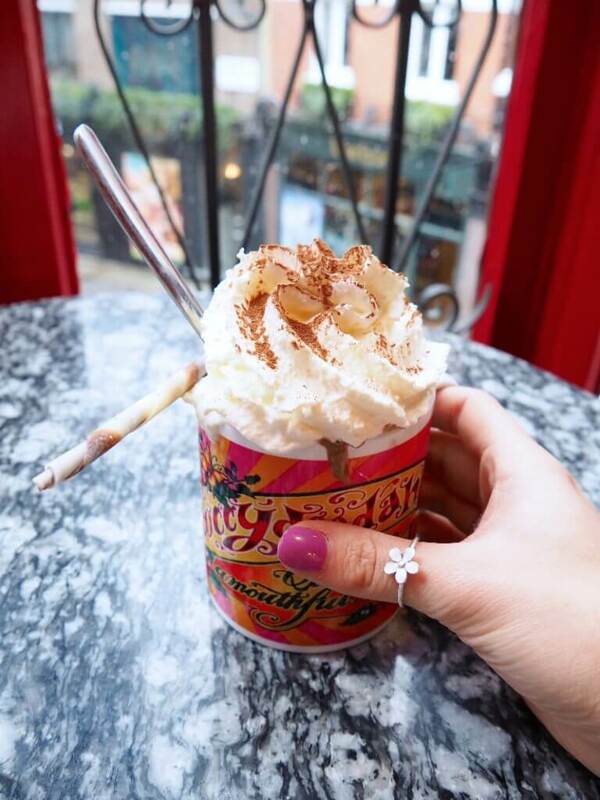 Call me cupid but if you’re ever in Central London and you have a wee sugar craving, i’ve 100% found your perfect match – Choccywoccydoodah. This exclusive art and design chocolaterie has one location in Brighton and one in Soho, London. Not only do they sell and serve the highest quality (and yummiest) chocolate, but they specialise in one off sculptured fantasies, wedding cakes, chocolate gifts, chocolate pets and an array of other naughty numbers. Whether it’s for your Easter Egg shopping, a quirky hen party, a birthday party or a sweet treat and a pit stop mid way through a shopping spree on Oxford Street – Choccywoccydoodah is calling your name. I headed down to the Soho location this week with my best friend to review the cake and hot chocolate (how awful) for an upcoming ‘Coffee and Cake Guide To Soho’ feature on my blog and loved it so much I thought it deserved its very own post. I also couldn’t choose between the photos and wanted to share them ALL, so here I am. The photos most definitely do the talking on this one, and I can promise you it tastes even better than it looks. Basically, you’re going to need to find a space in your diary ASAP. Warning: Do not scroll down if you’re trying to be healthy. These bad boys (Easter Eggs below) are selling for £10,000 a pop! Don’t worry though, if you can’t decided which one to pick you can bargain all three for just £25K. Stay tuned… I have some pretty exciting adventures coming up!